When longtime reader and fellow Pasadena resident Danielle discovered that The Astronomer and I were moving into her backyard, she was quick with a dinner invite. We enthusiastically accepted, of course, because there ain’t nothing better than having a local show us the town. 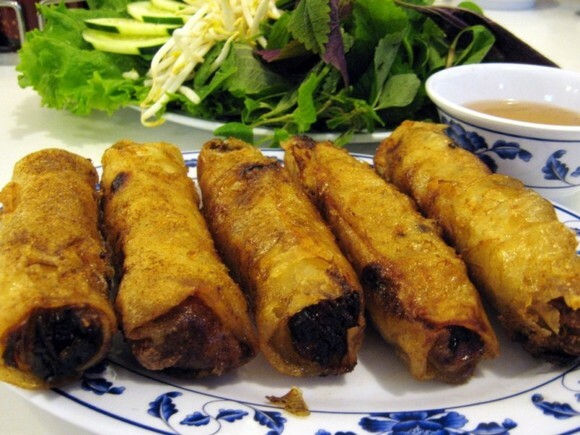 Our dinner destination was Vietnam House, the epicenter of drama in the San Gabriel Valley. Danielle informed us that the brother-in-law who managed the restaurant was somehow pushed out of the family business. 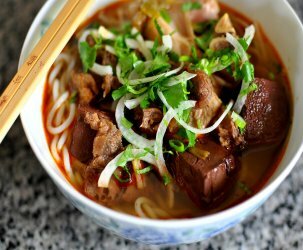 In retaliation, he and his wife left Vietnam House and opened up their own Vietnamese eatery a half mile down the street—Vietnam Restaurant. And get this, both restaurants’ menus are exactly the same. Scandalous, right? 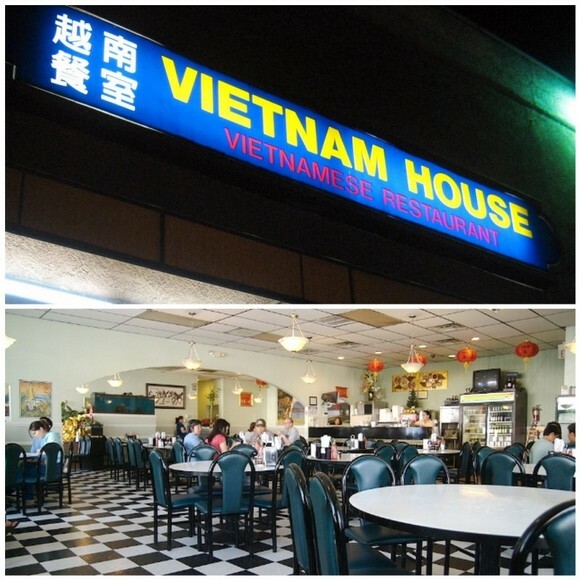 Even though Danielle favors Vietnam Restaurant over Vietnam House, she wanted to introduce us to the original shop. We dined on a Saturday night and the place was packed. The majority of the guests were partaking in the house specialty—bo bay mon (seven courses of beef). Since we all agreed that bo la lot was the only reason to order seven courses of beef, we opted to go a la carte. Danielle highly recommended an order of cha gio ($4.95) to start. 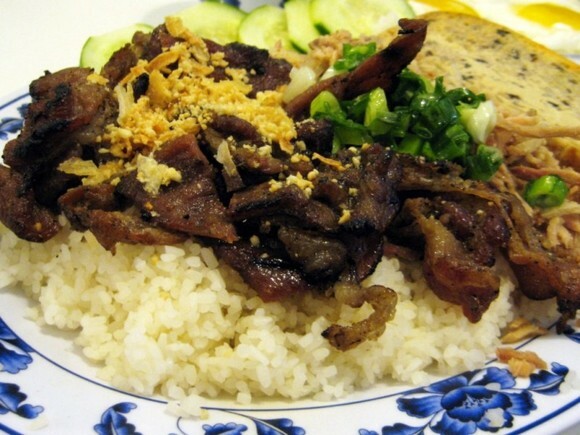 The golden cha gio were served with heaps of greenery and individual bowls of nuoc mam. My first cha gio was excellent, tasty meaty filling and crisp wrapper, but the ones after it were bogged down by too much oil. 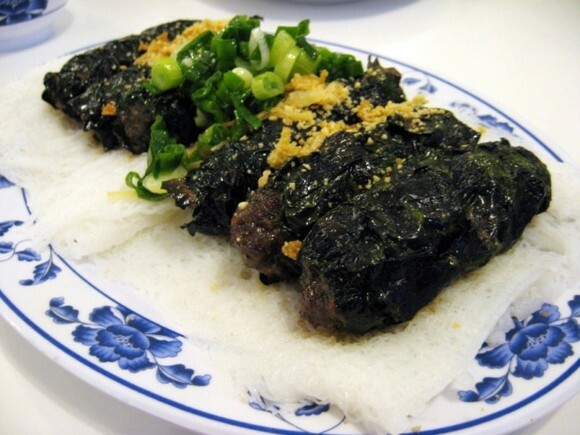 With thoughts of bo la lot dancing in his head, The Astronomer ordered the banh hoi bo la lot ($6.95)—sheets of thin rice noodles topped with seasoned ground beef wrapped in betel leaves, crushed peanuts and scallion oil, and served with nuoc mam on the side. This dish was decently portioned and full of bold flavors. 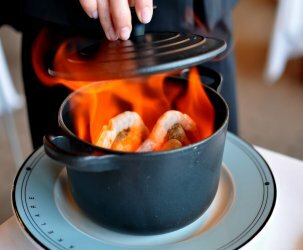 Thanks to a la carte, putting up with six mostly mediocre meats can now be avoided. I ordered broken rice with the works for my entree. 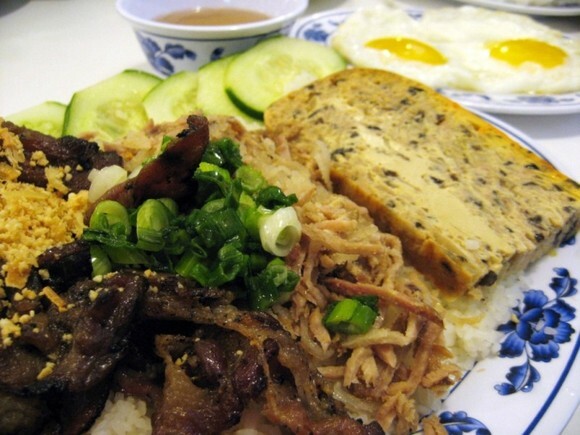 The com tam (broken rice) included bi (sliced pork skin and pork), cha (pork loaf), thit nuong (grilled meat), truong opla (fried egg), peanuts, cucumber slices, and scallion oil ($6.50). Unlike The Astronomer’s modestly portioned banh hoi, my broken rice plate could have fed a small village. My favorite components were the bi and cha. The thit nuong was disappointingly chewy and dry. However, it must be noted that everything tastes fantastic doused in lots of fish sauce. Danielle ordered Hu Tieu My Tho ($4.95) for her main course. Hu Tieu My Tho comes from the Mekong Delta city of Mỹ Tho. 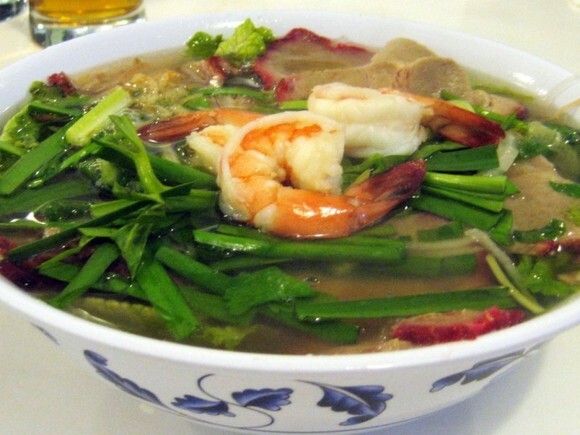 The dish is comprised of a clear pork-based broth, translucent tapioca noodles, sliced barbecued and plain pork, and garnished with shrimps and chives. Thank you, Danielle, for showing two new kids on the block a little drama and a lot of hospitality. 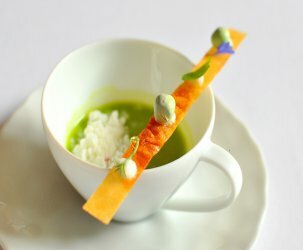 The soup and the broken rice look outrageous. However, that is enough food for like ten people. So funny the difference between yours and the Astronomer’s. I’m glad you liked Pie’n’Burger. It’s a dive, and there aren’t enough dives left in the world. Haha, I’m pretty sure the Hu Tieu My Tho you guys had was far more ngon than mine! Nothing like Vietnamese food in Cali. Pingback: Vietnam House | O Hei There!